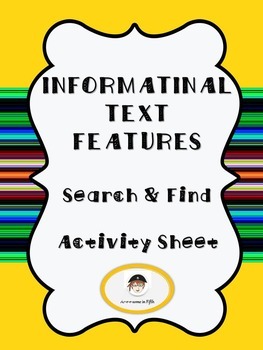 I have my students use this Text Features Search and Find Organizer to document their findings as they go through one of their textbooks or other informational text. I often use it as part of a pairs or small group activity. It can be used as an assessment as well. There is a list of twelve features, a column for the page number, and a section to write about how that particular feature helps with reading comprehension. Please check out my other ELA resources at my TPT store, Arrrsome in Fifth. Thank you!